Ever since we started the Dish, we’ve had the idea to do a “Lunch in Lynn” series to explore the plethora of ethnic eateries there, so when Corey Jackson of Downtown Lynn wanted company for lunch, I was all for it. 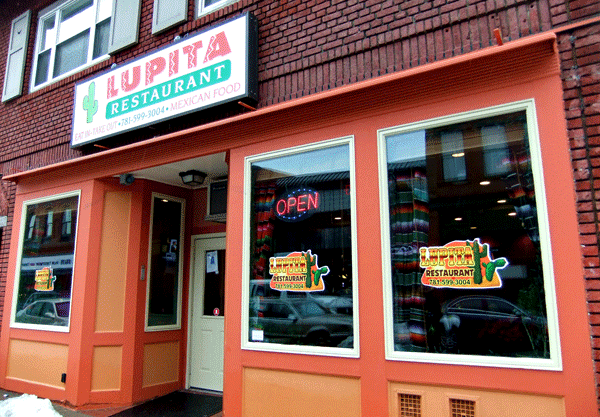 Our destination was Lupita Restaurant, the new location opened by the owners of Tacos Lupita, also on Monroe Street. 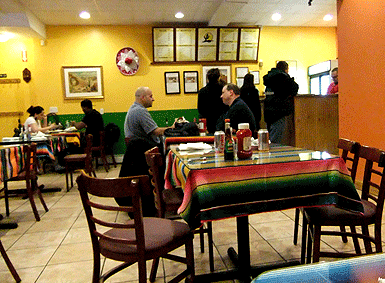 The interior is bright and open, and the décor leaves no question that you are in a Mexican restaurant. After perusing the extensive menu, we ordered at the counter and then found a table. We had just started to chat and sip our Mexican sodas, (I tried the Boing! Mango, which was awesome) when the server brought our food. Billed as appetizers on their menu, both the pupusa ($2) and the mulita ($4) are hearty enough to have been my entire lunch. 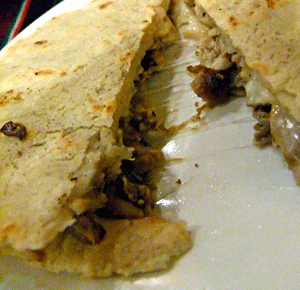 The pupusa revueltas, the smaller of the two, was a thick corn tortilla stuffed with queso and a mix of ground pork and beans served with a tangy cabbage slaw and salsa. While tasty, I preferred the mulita al pastor (shown at left), a sandwich of two grilled corn tortillas filled with roast pork (al pastor means “shepherd style,” from a rotisserie) cheese, beans, and lettuce. It had a unique savory rich mix of tastes that I really enjoyed and will definitely return for. 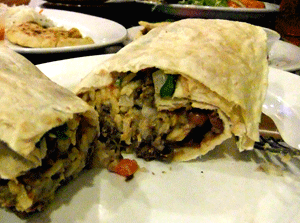 We also tried a carne asada burrito ($6), which was packed full of meat, beans, and rice. The flavor of the grilled beef was quite good, but I was stuffed after the mulita, and most of the burrito came home with me for the next day’s lunch. My dining companion went all out and ordered a specialty plate, which featured breaded and fried steak (similar to the mudiga steak found in Gloucester) served with rice and beans and a salad with nice chunks of fresh avocado. As artery threatening as it sounds, it was delicious, the meat tender and flavorful. 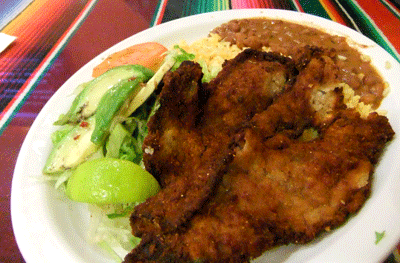 Lupita is a great place for lunch, especially if you’re on a budget. The food is tasty and served quickly, and the portions are a bargain at these prices. Corey tells me they are waiting on a liquor license that could make them a great cheap eats destination for dinner as well as lunch. While Lynn perennially suffers from a bad reputation, much is changing in the downtown area, and interesting things are starting to happen both in the arts and the food scene. The available variety of ethnic cuisine alone is worth venture over the border.